FRIDAY, 21st September doors and licensed bar from 7pm. Raising the roof to raise funds! Musical support is from the incredible young folk duo Mythopoeic veterans of Ely Folk Festival and much more and the amazingly talented local singer-songwriter Emma Spray. Sound and light will be by Calvin and Jason once again with Steve and Jane on the bar. 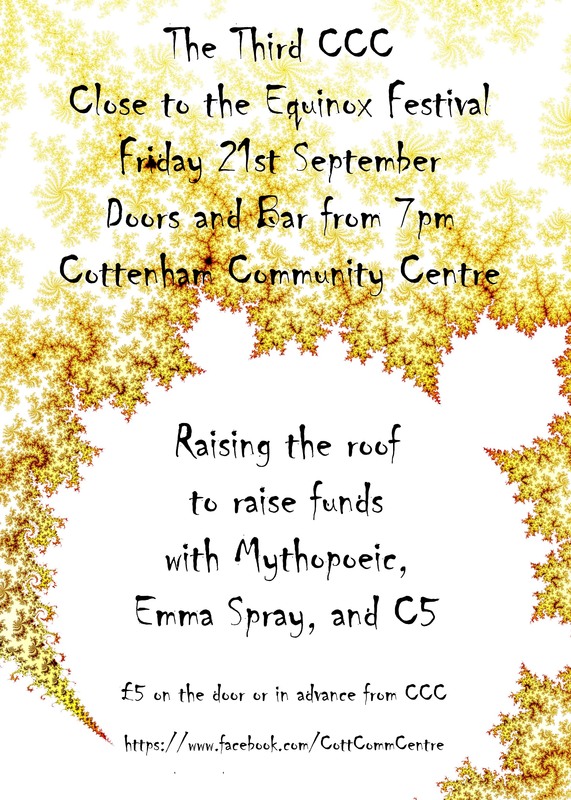 Raising the roof to raise funds; all proceeds will go to Cottenham Community Centre, charity 1128604. Doors and bar from 7pm. Music to around 11pm. Tickets £5, in advance from the CCC Coffee Shop or on the door. Tickets may be reserved online.